I am an avid reader. In a perfect world I would own a scrapbook store where I could divide my time between crafting, chatting with other crafters, baking something delicious in the back to share and reading. Since this is not a perfect world crafting and baking often take a back seat to a really good book. 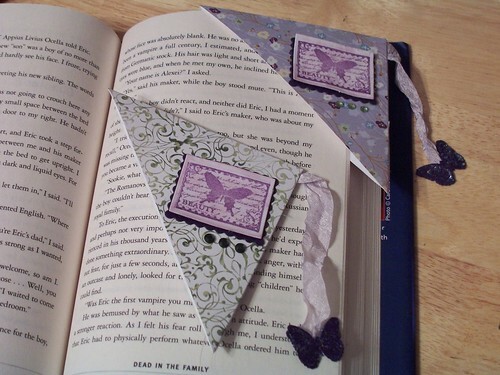 I joined a swap at Inspire Swap Chat to make these neat corner bookmarks. These bookmarks are larger than others I've seen but that is just fine with me, less chance it will fall out! There are several tutorials out there to make these so I won't bore you with another one. I googled large corner bookmark tutorial to find one I liked.